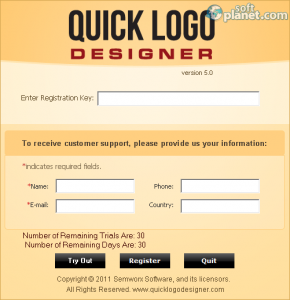 SoftPlanet makes it possible for everyone to get free Quick Logo Designer download directly from our servers. There is no registration needed for downloading. Sometimes a small picture means much more than a long advertisement. This is exactly the case with logos, which are small and unique pictures mostly used to promote and symbolize a company or an activity. By using logos you can save a lot of time or effort trying to promote your product and in time a logo may become everything for your company and a symbol that can be recognized in an instant around the globe. You may think that designing and creating a logo can be expensive and you will be right but not if you use a software program such as Quick Logo Designer – an application that has been created with logos in mind. 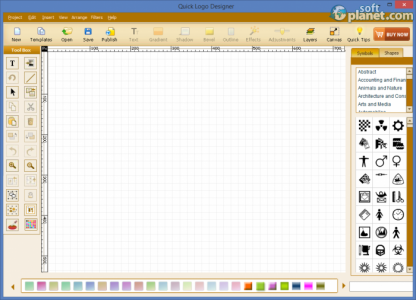 One of the good features of Quick Logo Designer 4.0 is that this program will not leave you alone in the dark ever since you start the application. This means you will not have to start from scratch designing new logos. Of course you can do this but you can also make use of a large number of predefined logos that have been sorted in different categories depending on the case. Thus you get logos for automobiles, computers, services, foods, children and many, many more. These logos offer almost everything that you may need but if you want to edit them you also get all the tools that you may ever need wrapped in a nice and easy interface. The interface of the app consists of two program windows, which is a fact that is especially true if you run the program for the first time. The first program window will offer you a large number of predefined logos to choose from and once you do the template you have chosen will appear in the actual program window. It consists of a large area right in the middle, which is the place where you work on your new logo. On top you have a toolbar that offers functions such as Save, Publish, Open, New, Templates and more. To the left you will see a tool box, which is exactly what it says it is – a place with numerous functions that will allow you to zoom in and out, make selections, paste objects and more. The right side of the program window is dedicated to symbols that you can use for your logos. The basic operations with this software include working with a preset template or a new logo that you can create on your own. You can easily open a new logo from the ones that have been given to you. It will then reside in the middle of the program window where you can stretch it and compress it, change its colors, rotate it, cut portions of it and much, much more. It really depends on you. 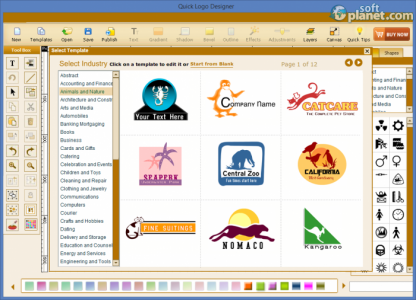 Quick Logo Designer 4.0 is a nice and powerful software tool that can help you design the logo of your dreams. It comes with a nice interface that will give you numerous tools to choose from and a large number of templates that will further ease your efforts. The app has weak points too and the most significant one that we can point out is slow installation but apart from this you will see no problems. 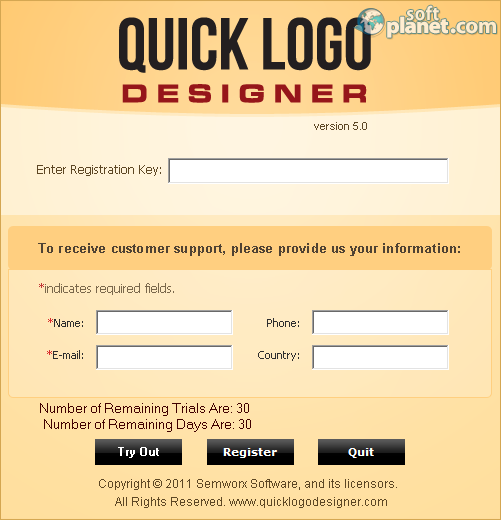 Quick Logo Designer is VIRUS-FREE! Our security scan shows that Quick Logo Designer is clean from viruses. The current version of Quick Logo Designer has been scanned by our system, which contains 46 different anti-virus algorithms. That ensures that Quick Logo Designer 5.0 is 100% safe for your computer.